The Cony boys and girls cross country teams are off to solid starts this season. Strangely enough for the Rams, their biggest opponent hasn’t been another team, or another runner. It’s the flu. Despite sickness and injuries, the Rams are still stepping up when it counts. Cony had a good showing in a Kennebec Valley Athletic Conference meet at its home course in Augusta last Friday. For the girls, freshman Tessa Jorgensen finished second with a time of 22:44.33, while her sister — senior Tara Jorgensen — finished eighth with a time of 23:17.52. Zina Gregor rounded out the squad’s top 20 finishers, placing 19th with a time of 24:49.08. The Rams had several finishers in the top 20 in the boys race. Caleb Richardson finished seventh (18:54.42), while Jack Wroton finished 10th (19:29.26). Myles Quirion (19:45.53) and Alex Farkas (19:47.17) finished 13th and 14th, respectively. Liam Buck rounded out the effort, finishing 18th with a time of 20:06.76. Totman also noted Ally Walker, Jillian Brown, Casey Gallant, Hannah Richardson and Macy Aube as runners who have put in some strong times so far this season. “We would not have the good results we have had so far without these athletes contributing to our team and becoming runners we can really count on to do well in our meets,” Totman said. At this point in the season, Totman said, everything in practice becomes vital toward success for the end of the season and postseason. Both the Mt. Blue boys and girls cross country teams had excellent showings on Friday in a KVAC meet at Lincoln Academy in Newcastle. In the boys race, four runners had top 10 finishes. Junior Jesse Dalton had the best showing, finishing third with a time of 18:36. Teammate Sam Stinson was close by, finishing fifth at 19:02, while Ethan McIntosh (19:34) was ninth and Jon Lesko (19:50) was 10th. Rounding out top 20 finishes were Enrico Echevarria (13th), Aubrey Hoes (16th) and Wyatt Viles (19th). The Cougars had an even better showing in the girls race, with sophomore Kathryn Cullenberg winning with a time of 21:29. It’s been a strong season for Cullenberg thus far. She finished third in a KVAC meet in Leavitt on Sept. 15. Mt. Blue ended up having eight runners finish in the top 15, with Meg Charles placing third (23:18), Maeve Hickey placing sixth (23:57), Kayla White finishing eighth (25:41) and Grace Dalton finishing ninth (25:49). Annaset Jackson (11th), Beth Nicholas (12th) and Gracie Ward (14th) rounded out the group. It was by far the best team effort the Cougar girls have shown so far this season. Maranacook and Waterville continue to be among the top two teams in the KVAC, particularly in girls cross country. 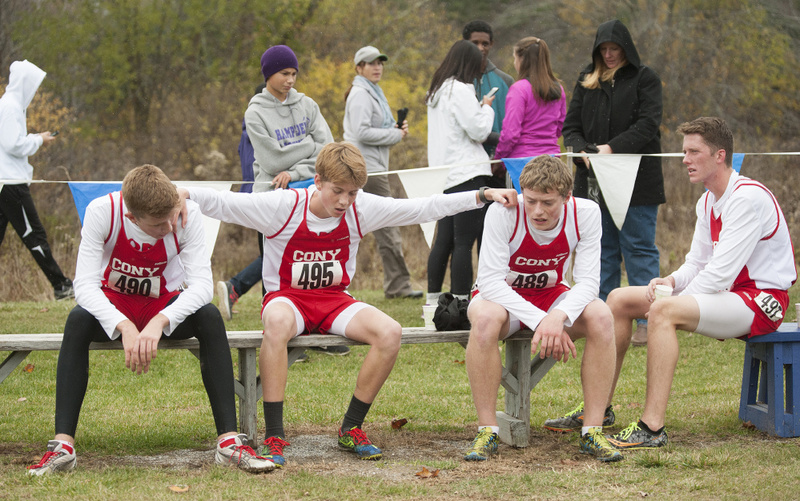 Both teams made their mark in Friday’s KVAC meet at Cony. Maranacook’s Laura Parent came away as the winner of the girls race (22:17.01). Teammate Sophie O’Clair finished fourth (22:56.02). Gwinna Remillard was the top finisher for the Purple Panthers, finishing ninth (23:26.95). Luke Bartol was the top finisher for Maranacook in the boys race, as he finished fourth (18:40.88). Waterville’s top finisher was Andy Chambers, who placed 11th (19:35.01).